Sticking with middle-brow Scottish literature, I followed Irvine Welsh’s Filth with another dark, scary, psychological story about a disturbed Scottish individual enacting weird personal fantasises within a warped and conflicting world view: The Wasp Factory by Iain Banks. I knew NOTHING about this book before beginning it. All I’d read by Iain Banks was his famously moving “I’m dying of cancer” essay published a year or two ago, whenever he died. 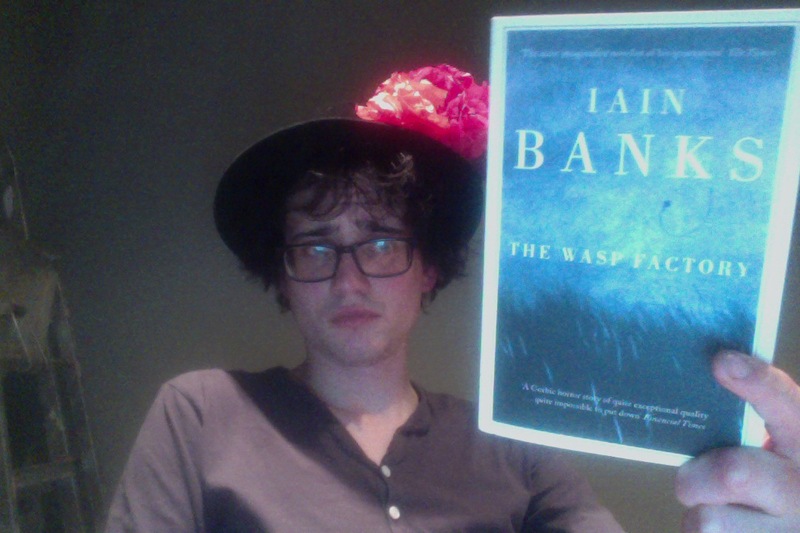 (I possess my copy of The Wasp Factory because my morbid mother sent me one when Banks did “kick the bucket”*.) I knew Iain was a sci-fi writer and had, to be honest, presumed this novel was about a factory that made giant robot wasps with laser stings that went round terrorising a community. I imagined the plot would be the story of a group of plucky children/teenagers** destroying the Factory during their summer holidays. Or at Christmas. To sum up: I was expecting a trashy, light, sci-fi Enid Blyton-y adventure. What I got was very different. The Wasp Factory is about a deranged teenager, Frank, who lives on a tiny Scottish island with his former hippie, former academic, father who survives on accumulated family wealth and a lot of vegetable curries. As Frank’s father potters around the house, the youth runs around their island killing animals, sacrificing insects and trying to telepathically communicate with his brother (freshly escaped from a psychiatric hospital) using a preserved dog skull he keeps on a shrine in an old military bunker overlooking the North Sea. And this, the location, far more than the novel’s many horrific scenes (child murders, torture of animals, severe abuse of trust, genital mutilation and the truly, truly awful (and thus narratively feasible) sight that caused the mental disintegration of Frank’s brother), was the biggest shock, the biggest twist. I knew that there are mysterious islands and big old houses all over the west of Scotland, I readily accepted that and slid my imaginings of The Wasp Factory into the locales of The Wicker Man and other Such Gothicry. But instead, no: Banks’ novel was set on the East coast, north of sainted, Southern, Edinburgh, up in the oil lands and the wastelands I know nothing about. In part, this may be because I planned a trip to the Inner Hebrides last Summer (which I had to cancel due to a death in the family***) and thus know more than the average person about that side of the country. But scary Scottish islands are perhaps more scary when they’re in unexpected places. Perhaps. I don’t know. But, The Wasp Factory itself is a haunting book, full of remorseless violence, expansive and memorable characters, images that struck me hard in the way that Haruki Murakami’s do (animals on fire, maggots, polished skulls, giant kites, the terrifying “wasp factory” itself) and is an engaging read. An angry teenage first person protagonist is hardly original, but I enjoyed this one as an adult reader far more than the over-rated Catcher In The Rye, for example. It’s haunting and chilling, and I hope the nightmares created by it stop within a few days, but a great piece of light, dark, fiction. If you want to be a bit shaken up, give it a read. Great stuff. * A weird phrase to be a normalised innuendo for “died”, because it refers absolutely to hanging oneself. Which Banks didn’t do – he had cancer. ** Because (I presume) all sci-fi is aimed at children, teenagers or adults who self-identify as one of the two, I imagine it features them as protagonists. I don’t know, though, I’ve never read any. Unless Kurt Vonnegut counts, and most of his protagonists are very immature/maladjusted. *** I don’t mean the Karl Ove Knausgaard book, I mean a real one. Though I’d cancel most things for Knausgaard.